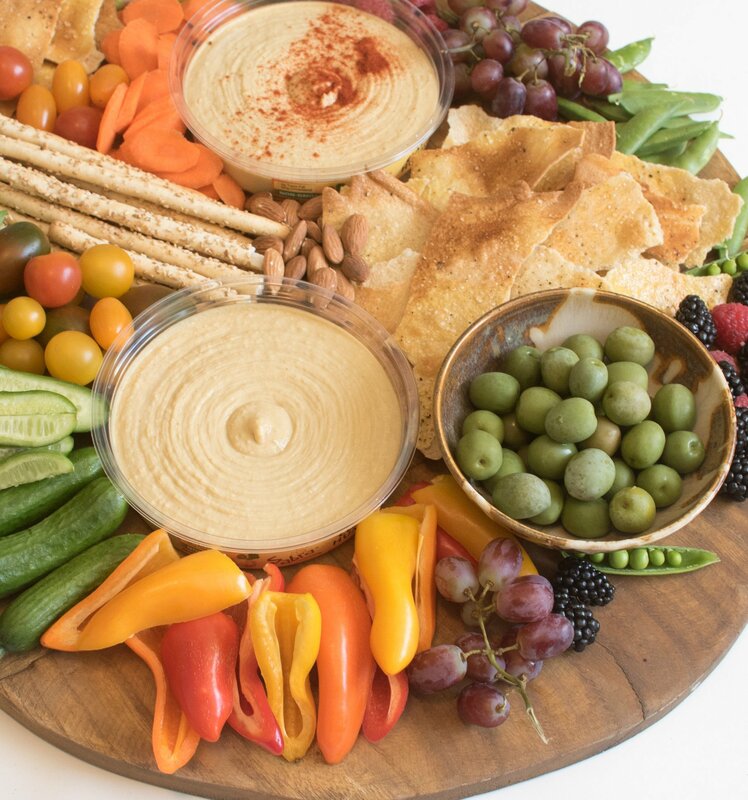 A simple DIY hummus platter is a beautiful addition to any party, or it can be a meal all on its own! And it couldn’t be easier to make! I’ve been majorly into making beautiful boards/platters of really simple things lately, and I’m here to show you one of my favorites: a simple hummus platter! They are really pretty and so easy to put together. They can easily be adapted to meet dietary needs (perfect for a party!). Adults and kids alike enjoy the variety. You don’t have anything to cook, there’s not much prep besides cutting up a few veggies, and finger foods aren’t fussy. Can be an easy unofficial meal – perfect to munch on when dinner is going to be later, when friends drop by, or for girls’ night in with drinks (I recommend some strawberry rhubarb lemonade) and dessert. I have been making some version of this same board over and over again the last few months and we just don’t get tired of it. 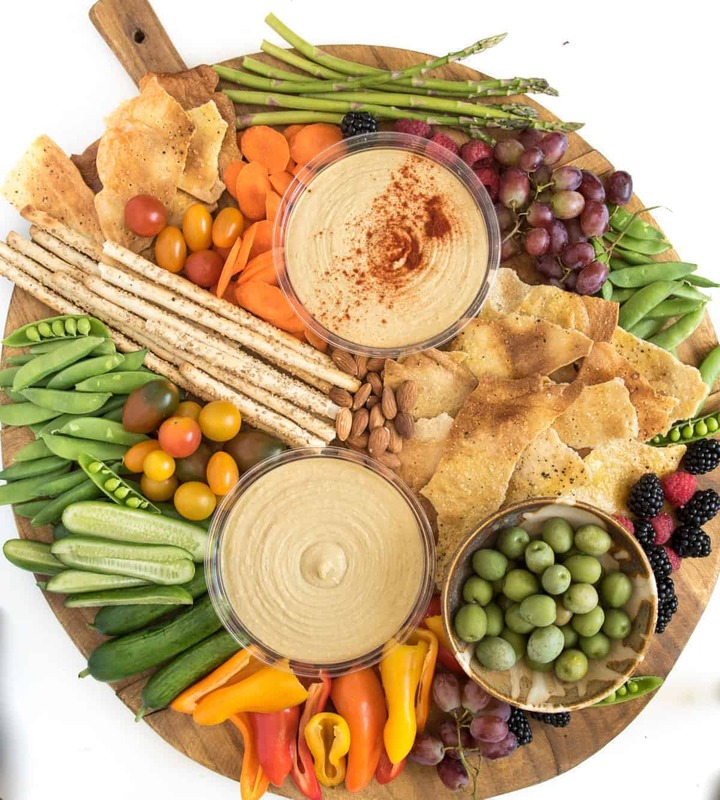 This is the perfect thing to make when you want to have your girlfriends over for a night in (or a mom day-date/play date), when you are invited over to a party (so impressive), or when you have someone pop in unexpectedly and need a little something to munch on (truth be told, I’ve turned my veggie box into a hummus platter in no time when people show up). It’s light, it’s fresh, and it is oh so simple. What’s not to love?! When you first see this board you might think that it looks complicated, but if you take a closer look, you will see it is made with some really simple ingredients. This can be anything! You can use a cutting board, some fancy vintage bread board from Bulgary you bought on Etsy (that may or may not be a confession), a marble or slate slab, vintage-inspired enamelware, or even a cookie sheet. If I’m taking a hummus board to a party (just did that last night! ), then I’ll put it on a simple cookie sheet because they have sides and I have lids for mine. You can also take the individual parts and assemble them once you get to the party too. Sabra has so many kinds of delicious hummus to choose from. Here are a few of my favorite varieties: Roasted Red Pepper, Olive Tapenade, Supremely Spicy, and Toasted Pine Nut. 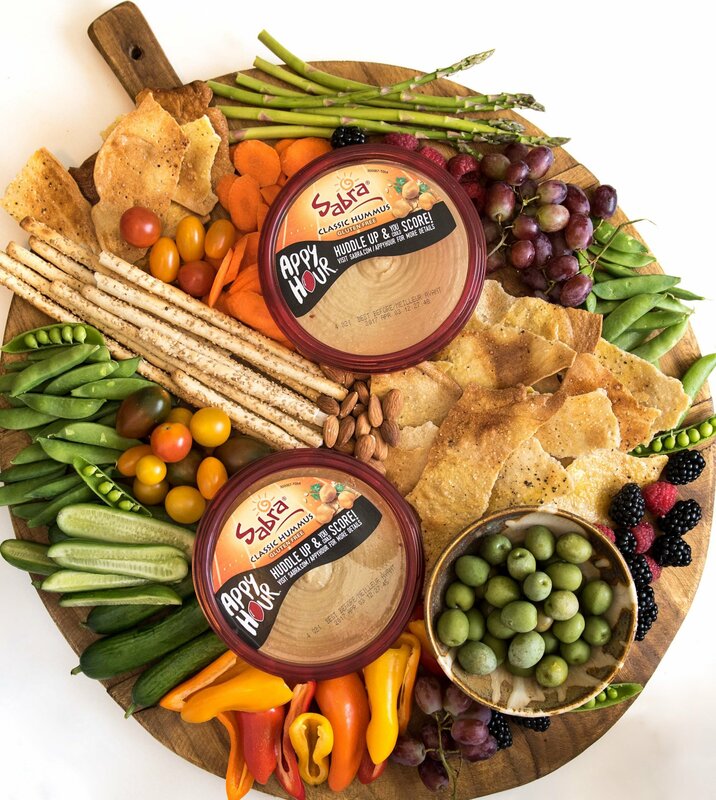 I’ve never met a Sabra hummus I didn’t like, so feel free to try ones that sounds good to you. Veggies and a few crackers/pitas/pita chips are all you really need. Carrots, mini bell peppers, cucumbers, sugar snap peas, and mini tomatoes are always good choices. You can try things like fresh asparagus or fresh green beans (yep, you can eat them both raw! ), too. Getting the mini English cucumbers and multi-colored tomatoes isn’t necessary, but they look great on a hummus platter. When it comes to crackers, I like to find ones that are interesting in shape, texture, or color. Homemade lavash crackers are super simple and very pretty. I also like to find sesame sticks because they look great. Use the vegetables and crackers that you like and are easy for you to find. Bonus points for trying something new or getting something because it looks pretty. There are so many fun things that you can add to your hummus board to make it unique. I like to add nuts, olives, marinated cheese, fresh fruit, and even dried fruit. Grapes are always easy and simple, and seasonal berries can be a treat. I also love going to the fresh olive bar at the fancy grocery store to pick out a few new-to-me things, and who can say no to a Marcona almond? I like to think of this as a time to try a new-to-you item, pick up something seasonal, or to add a favorite indulgence. This is the time to have a little fun. Don’t overthink this part. I like to place my hummus containers first, then if I have any little bowls of olives or marinated cheese I’ll put those down, then I’ll just casually add everything else. Start with your veggies, crackers, and larger pieces of fruit, then fill in any gaps with the small things like dried fruit and nuts. It’s a good idea to use sturdy vegetables like celery or cucumber spears to “fence” in vegetables like tomatoes that might want to roll around. Again, we aren’t going for a perfectly manicured veggie tray. This is casual, simple, and a little messy. You can add a few sprigs of fresh herbs if you’d like a garnish. I also like to open up a pea or two so that you can see their pretty insides. It’s nothing fussy, but a few little finishing details really bring a hummus platter together. 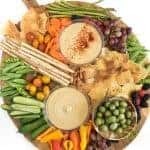 A simple DIY hummus platter is a beautiful addition to any party, or it can be a meal all on it’s own! And it couldn’t be easier to make! Place your hummus on your board first. Add your vegetables and then crackers. Don’t feel like they have to look perfect, just lay them out. If you are adding anything extra like olives you might want to put them in a small bowl. Fill in any open spaces with additional crackers, fruit, dried fruit, nuts. Serve right away. When you look at the hummus platter with its individual parts, it’s easier to see how simple it is. I hope this little tutorial on creating a perfect hummus platter made them feel more attainable for your own kitchen. 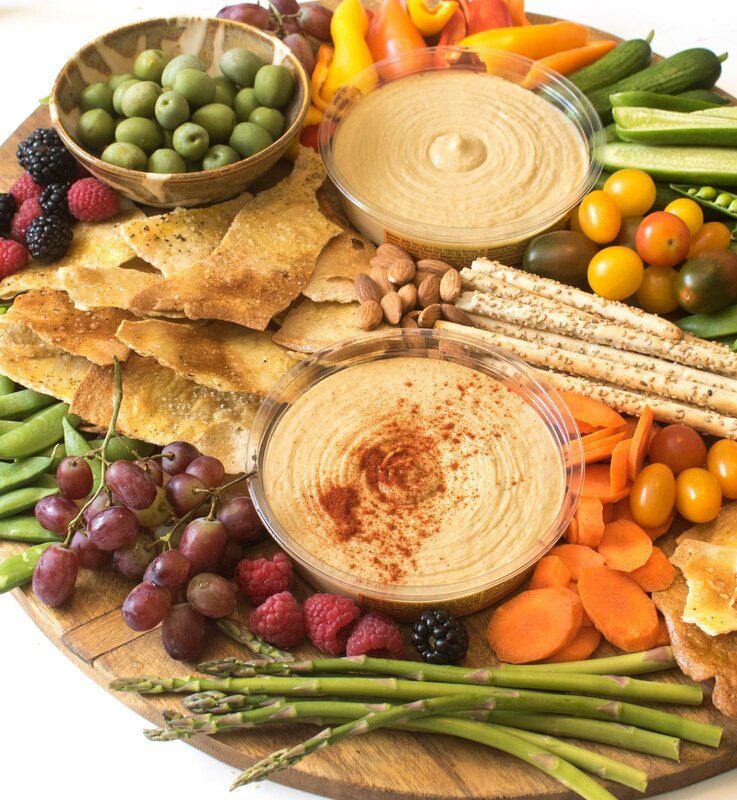 I hope you take a hummus platter to every party/dinner/cookout/picnic that you are invited to this year.